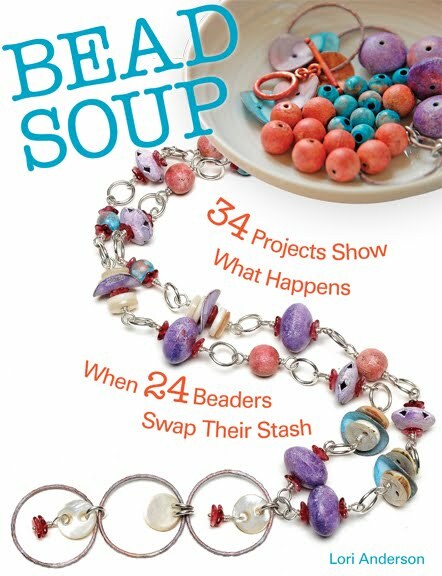 On March 14th, the beading community lost a very talented jewelry artist, Judy Glende. I knew Judy only through the many emails we passed back and forth, and she was always fun and bubbly. She owned Judith B. Designs (and you can still purchase her remaining pieces there and here -- I have one and it's very special to me). Her obituary shows just how loved she was by her family, and her marriage of 30 years is something I look up to. 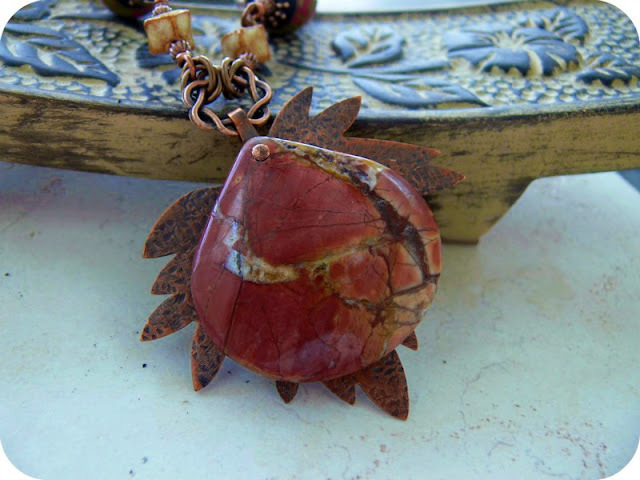 Made out of jasper and copper, it's a lovely fall piece. The leaf above came from Judy, and I did the work on it. The polymer clay beads were made by ArtyBecca. The necklace measures 22" (not including the pendant) but can be shortened upon request. The pendant measure about 2.75" top to bottom, including the copper ring. This particular necklace I'm selling rather than auctioning. The second piece I made with Judy and her family in mind, and it will be auctioned. Here's the necklace, which I named "Rejoice in Her Life". I believe that a life should be celebrated even while mourning. 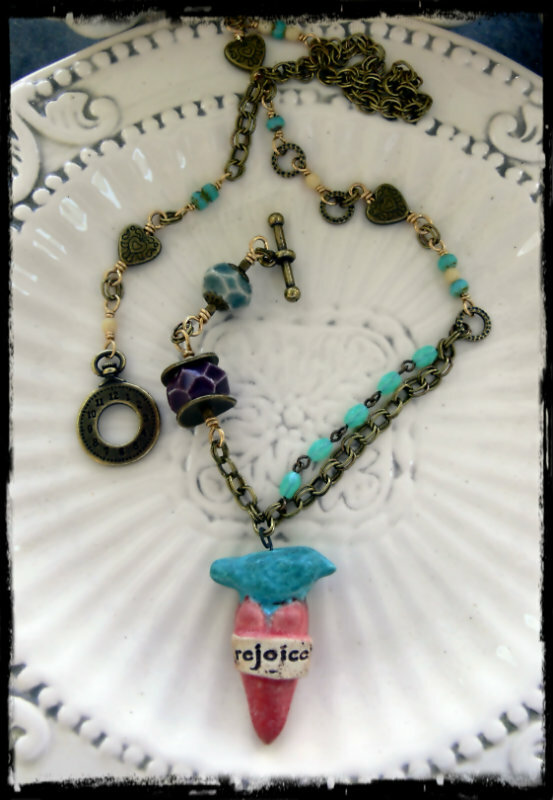 The necklace is made with a 1.75" handmade ceramic pendant made by Diane Hawkey -- a bird perched on top of a heart proclaiming "rejoice". 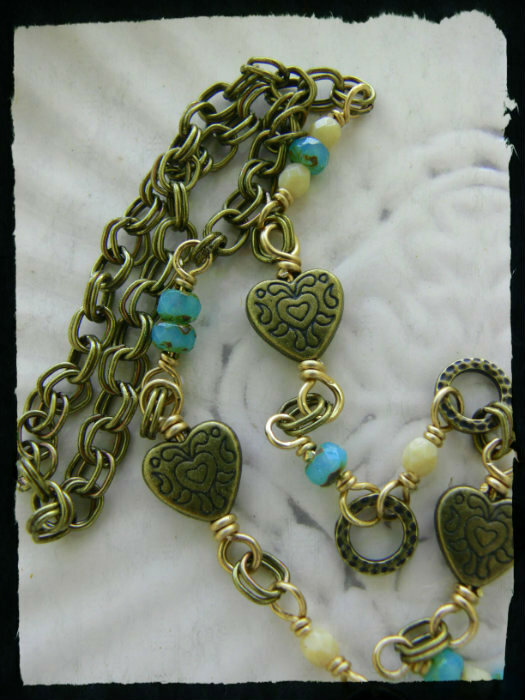 One side has a short double strand of brass chain and vintage opal glass chain. 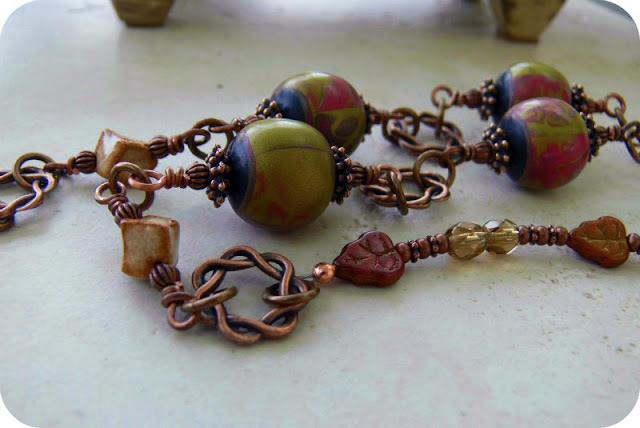 The faceted ceramic beads are also by Diane Hawkey. 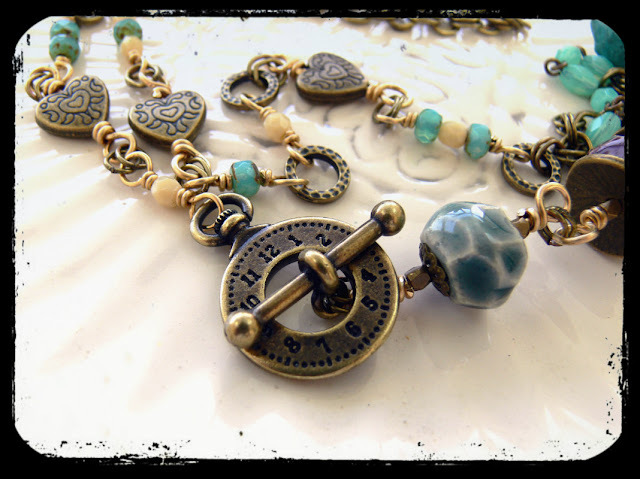 The entire length of the necklace is 22" but it can be adjusted upon request. for the love she showed everyone and the love given to her. I used a brass clock toggle because love is timeless and forever. 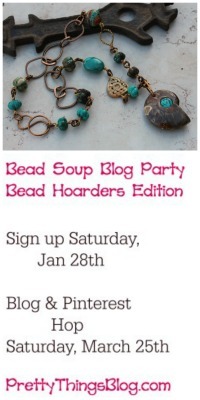 (email or email in your blog account). Two beautiful pieces :) I love to extra symbolism of the clock toggle! 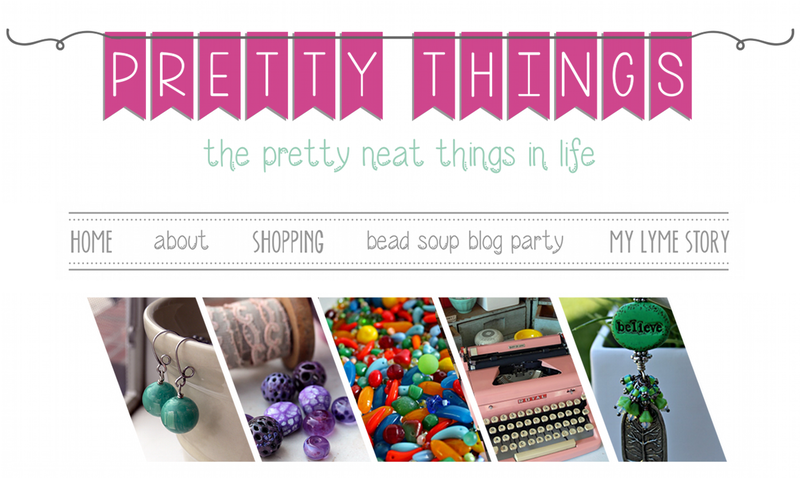 What a beautiful thing you are doing and such beautiful pieces as well! Lori, I just know about this story =( Did Judy pass-away because of Melanoma? If that so, I have black ribbon awareness in my FB shop. I would love to donate the sale. Where I can send the money? Lori, your thoughtfulness in the making of the heart necklace just made me cry. It is such an embodiment of the jewelry community, and Judy in particular. Both pieces are beautiful, and thank you for letting us know that we can still buy her pieces, because I didn't know that. 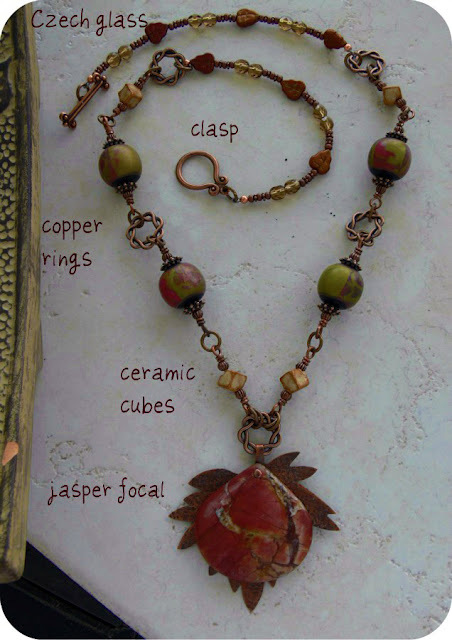 both pieces are lovely, but really love the jasper focal .. WOW that is gorgeous! Both are unbelievable! I adore the first one, especially with Judy's leaf! Thank you SO much for participating and all the help you gave me. I appreciate it Lori! Lori, both pieces are so lovely and filled with tribute to Judy! Good design comes from the heart. Beautiful Lori! Beautiful and symbolic. This was definitely a lump in throat challenge for me. I miss her emails and blog posts. 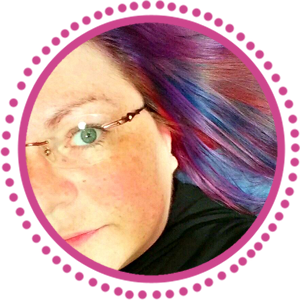 Stunning creations, Lori!! What a beautiful tribute to Judy! I didn't know her but her work is amazing! Her creativity and craftsmanship will be missed for sure! I know that Judy is smiling on us today! I wish that the timing would have been right to participate, but I am working on some bangles with some of her etched pieces to reveal next week that I will sell for the memorial for Miss Judy. She is our beading angel now. Enjoy the day! Both are gorgeous pieces but I really love the first one. I really need to pay more attention to the FB group as I didn't even know that this was occurring and I would have loved to join in. Instead I will be making a donation to the horses. Very lovely designs, so well thought out as always. Two really beautiful necklaces Lori. I love the symbolism you've put in the second one particular. Both pieces are lovely. What a special thing you all are doing. Both are beautiful! 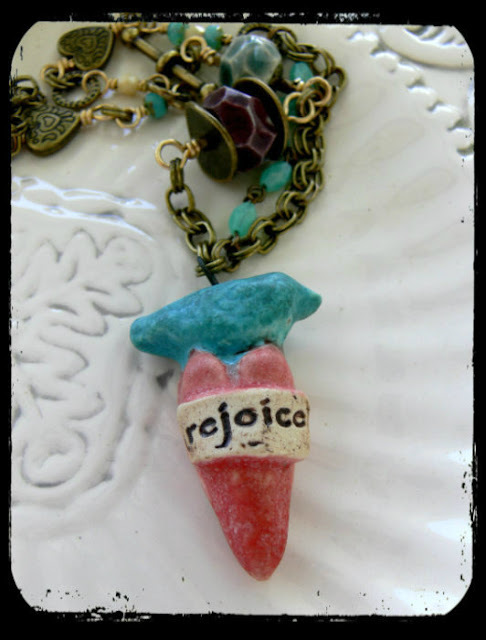 I love the rejoicing heart! Do we post bids for this piece here or elsewhere im confused. What a beautiful tribute to Judy. I love them both. I especially love the first one with the stunning focal, leaf, and bronze palate. Praise for you Lori. You are a wonderful friend and doing such great things. I hope you are successful in your auction. I will try to help also. Lovely tributes Lori! Beautiful tributes to a beautiful soul. Those are so beautiful and touching, Lori! You always do such beautiful work! I LOVE those brass hearts!!! Those are both lovely! I especially like the copper leaf pendant in the first one!